This one (Libbey #3770) has the capacity of 4-1/2 fluid-ounces. That is just about perfect for holding a true cocktail – 2 fluid-ounces of liquor, about a fluid-scruple of bitters (~ 2 dashes), about 1/4 fluid-ounce of sugar syrup, and the water added to the drink while stirring it through ice before straining. After its introduction during the International Exposition of Modern Industrial and Decorative arts in 1925, the conical version of the cocktail goblet went on to become the very symbol of all mixed drinks for many people. Of course, this had something to do with the prohibition-era fad of calling all drinks ‘cocktails.’ It is unfortunate that so many drinks other than cocktails have been served in the conical cocktail goblet over the decades. It allows the drink a very wide surface area. That means that the drink will not stay cold very long. What’s worse is that the shallow slopes of the inside of the vessel hold a larger percentage of the drink closer to the surface than does the more traditionally-shaped cocktail goblet. 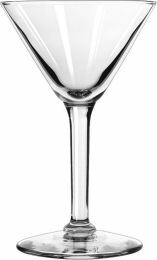 At least the one shown here (Libbey #8454) retains the capacity of 4-1/2 fluid-ounces, preventing it’s miss-use for lots of other types of drinks. It is also acceptable for true cocktails in the sense that the release of the aroma of the bitters to the olfactory nerves is a crucial part of the performace of true cocktails – to remove most of the sensation of the harshness of ethanol. Aside from the fact that the conical shape has been so over-used for so long that it has become culturally compromised, the use of this goblet can still be defended on mixological principals. It is acceptable if you use it to drink a true cocktail, and at a quick enough rate that the drink will not become critically warm. The Sidecar is an excellent example of a sour forced into cocktail drag. But, being that sours have more volume than cocktails do (assuming the then-standard practice of using a total of 2 fluid-ounces of liquor in mixed drinks) because they contain more sugar or sugar-syrup and plenty of sour juice, the Sidecar would not have fit into a cocktail goblet at the time of the birth of the drink. Perhaps the real reason the drink was called ‘Sidecar’ was that the overflow was served in a separate short tumbler to the side of the goblet. If bartenders were to persist in calling the Sidecar a ‘cocktail’ and serve it in a cocktail goblet, one of two things were required. Either the the jigger (2 fluid-ounces, at the time) could be abandoned as the total liquor in any drink, or larger versions of the cocktail goblet could be manufactured. As an early example of the abandonment of the jigger, the Sidecar recipe in Robert Vermeire’s 1922 book, Cocktails and How to Mix Them, calls for 1/6 of a gill (the gill being 4 fluid-ounces) of each; the brandy, the liqueur and the sour juice. 1/6 of a gill is 1/3 of a jigger (or 2/3 of a fluid-ounce), and so the total of all three ingredients before dilution, including the lemon juice, is 2 fluid-ounces – the same main volume of a pre-dilution true cocktail. 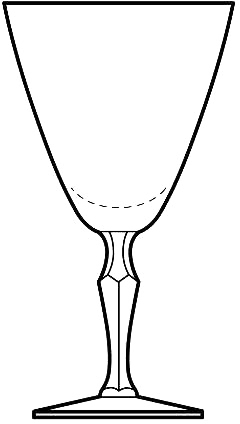 It would fit the goblet and would no longer require the ‘side-car.’ In addition to de-jiggering drinks (and replacing mixology in bartenders’ minds with the sort of crap-shoot experimentation and recipe-memorization that persists to this day) larger versions of the conical cocktail goblet began being produced. The first ones were modestly larger, but now they can be had in sizes larger than a pint. Here is one example of an over-sized, conical cocktail goblet (Libbey #7518) – shown in exactly the same scale as the other goblets in this post. It’s capacity is 10 fluid-ounces. A simple, but traditional, Whiskey Cocktail would get almost lost in the bottom of this one. The silly over-sizing of cocktail goblets, and their universal over-use, have finally caused large parts of the drinking public, and the business that serves them, to reject the conical cocktail goblet altogether. Ah, finally! Someone is choosing glassware that makes sense according to both older tradition and the sensitive understanding of the mixological effects of shapes and sizes of glassware upon the quality of drinks… No, that’s not what happened at all, sadly. Here’s what did happen. Bartenders and customers who have rejected the conical cocktail goblet have proven to have done so out of the worst sort of empty hipsterism. They have all rushed, in lock-step, to embrace and use (and extol the glory of) the Champagne coupe goblet. In terms of physics, this glassware is only good for toasting with sparkling wine (fluted goblets are delicate…) and for making the spectacle of filling a pyramid of coupes, while pouring only into the one at the peak. 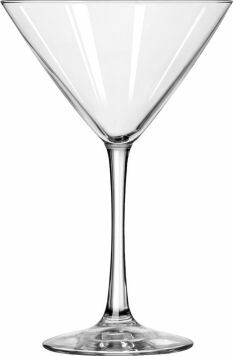 Just look at this goblet (Libbey #3055) that Libbey has featured in their latest catalog as being for “retro cocktails.” It has the same sort of surface-area, and therefore drink-warming performance, as the conical cocktail goblet. What’s worse is that it is even more shallow. Equally shallow will be the hipster’s defense of using coupes. If they really want to sound thoughtful, they may talk about the release of aroma. But, that was already possible with either the traditional cocktail goblet, or, for extra release, the conical cocktail goblet. Next reason, please…? “It just looks so cool and retro,” is one response I have heard. This is all image and no substance. So, what glassware would better suit non-cocktails that was also actually used in traditional American mixology? The now-rare sour goblet (a.k.a. Delmonico, or star goblet) was once widespread. 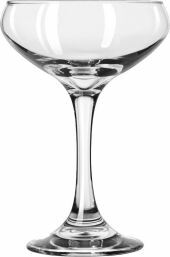 It looks a little bit like a fluted Champagne goblet, but with a shorter stem, and without any fluted, inward-taper at the top. Sour goblets had capacities of up to 6-1/2 fluid-ounces, with something between 5 fluid-ounces and 6 fluid-ounces being most common before they began to disappear in the 1960’s. For other drinks, such as blossoms and flips, that may have more noticeably aromatic garniture or ingredients than sours did (yes, bitters in sours is a new thing – a good thing, often, but new), the standard wine goblet (or claret goblet) was often used. This was the traditional shape of wine goblets a century ago. The claret goblet usually had a capacity of 5 or 6 fluid-ounces. So, given the fact that the Champagne coupe goblet is just as worthy of ridicule as the conical cocktail goblet it has been replaced with by hipsters, and that the more traditional glassware is no longer really available – what is a thoughtful mixer to strain his-or-her mixed drinks (that are not true cocktails) into? Libbey, the giver of so many silly things, has also in their recent catalog offered what they think of as a “Georgian Irish Coffee” goblet (Libbey #8054). It has the capacity of 6 fluid-ounces. It offers a surface area similar to the old-fashined claret goblet for the advantageous release of aroma, but without over-doing it – and while giving the drink plenty of heat-avoiding depth. Furthermore, while not being as perfect for sours (like the Sidecar, Whiskey Sour, etc.) as is the sour goblet, it is a infinitely better for them than the Champagne coupe. I recommend everyone get off the coupe bandwagon – it only leads to pretense and warm drinks. Snap up a case or two of Libbey #8054. It surely won’t last once its features are understood by those in the know. I doubt Libbey did a massive run of something they think of as nothing more than a Georgian patterned Irish Coffee goblet. Now, enjoy a drink without feeling rushed by heat exchange. Though its not Libby, I found this glass at Ikea and liked it a lot. Reminded me of the cocktail goblets in your bar setup. It holds 5 oz so its pretty close to perfect at a good price. I am not surprised that it reminded you of Elemental Mixology glassware. That’s where you would have already used that Närhet goblet before. I’ve been using it for some time for blossoms, possets and flips. Ikea, or someone else, got the metric conversion wrong. They say that it holds five fluid-ounces, but it actually holds six. Yes, I actually measure the volume of glassware myself whenever I get it. I have found that most glassware of European design or origin is listed with incorrect fluid-ounce volumes. It is actually quite common for them to have at least a fluid-ounce of greater capacity than listed. But, that goblet is a perfect choice for any drinks that need a six fluid-ounce claret goblet.